Columbia’s Aged Care Service’s reputation for providing high quality care and service delivery with integrity, excellence and expertise has earned us the trust of our residents, their families, and related health providers to our facilities. If you’re interested in a career with a dynamic and growing organisation that fosters professional development and career progression, then we would like to hear from you. 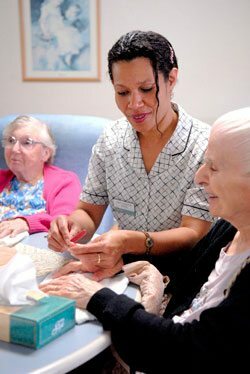 We offer careers for Aged Care professionals in nursing, administration and management. A variety of shifts from which you can choose. Rostering options to help you balance between work / quality of life. An extensive Orientation and Socialisation program in order to assist you to adjust to your new environment. A stable, safe and secure working environment. A high level of support, including ongoing position specific education and on the job coaching. Wages and conditions as per the relevant NSW State Award but a competitive salary offer may be negotiated based on skills and/or qualification. Enquiries and applications will be treated with utmost confidentiality. Please forward a covering letter along with a resume and the names of three current referees to careers@cnh.com.au. You must already hold a Certificate IV in Aged Care with a minimum of 2 years experience to apply for employment in one of our facilities. Please note that only applicants with 2 years experience will be contacted. Please note that police checks are essential to any appointment and are required by legislation; however, we will assist you with this process. Only people with the right to work in Australia may apply for a position at Columbia Aged Care Services. We do not offer sponsorship at this time.